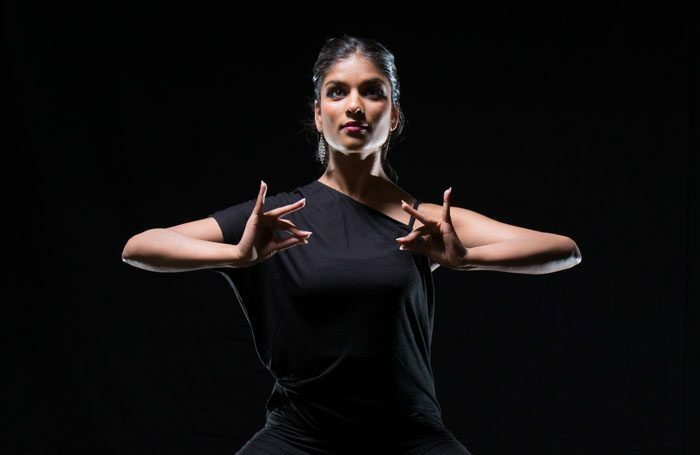 Sigma combines the astonishing skills of two female jugglers from the Gandini company – Kati Yla-Hokkala and Kim Huynh – with the percussive patterning of classical Indian Bharatanatyam dance, courtesy of Seeta Patel and Indu Panday. The artistic intersection they arrive at is often one of great intricacy, give or take the odd dropped ball. Moments of stunning physical articulacy abound. Emerging from between two shadowy screens while brightly coloured balls loop above, Patel and Panday’s fingers unfurl and twist from the wrist into flowering configurations. Coolly controlled sections of juggling are embellished by the dancers’ snaking arms and gestural poses. The performers play intelligently with rhythm and acceleration – at times it becomes a sensory exploration of music and maths. Physical dexterity is sometimes matched by vocal accompaniment: there’s a wonderful section in which London place names are made verbally malleable, the syllables strangely accented and emphasised to the beat of Panday’s feet. Sigma is a clever and experimental show in diffuse parts that’s leavened with humour – a slinky pastiche of Bob Fosse jazz dance suddenly undercuts the seriousness. However, occasional jokey comments are muffled and don’t quite land, while the denouement is a little bewildering tonally. Nevertheless, it’s an engrossing piece.